Located at a distance of 16 km from Tiruvalla, the Arnamula Temple is dedicated to Lord Krishna. The temple is believed to be built during the Mahabharata era. The annual snake boat race conducted here is not just a competition, rather it is a an attempt to recapture the cultural glory of the past. The Kaviyoor Stone temple, located in the banks of River Manimala is of great historical and archeological significance as the stone figures here are considered to be the earliest specimen of stone culture. is one of the most ancient temples in the state, the Vadakkunathan temple contains many decorative wall paintings and historically important pieces of art. 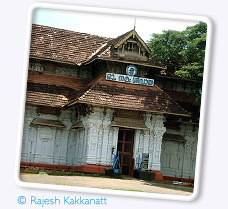 The temple itself, with its thick mansonry walls and lofty gopurams is a classic example of the Kerala style of architecture. Exquisite wooden carvings can also be seen in the central shrines. The Pooram Festival here, is celebrated in April- May, on a grand scale.